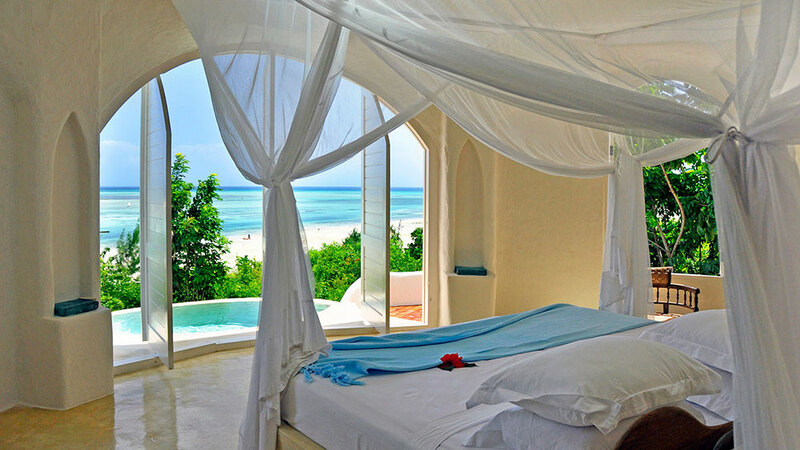 Kilindi is an incredibly unique and beautiful collection of chalets on Zanzibar’s northwest coast. 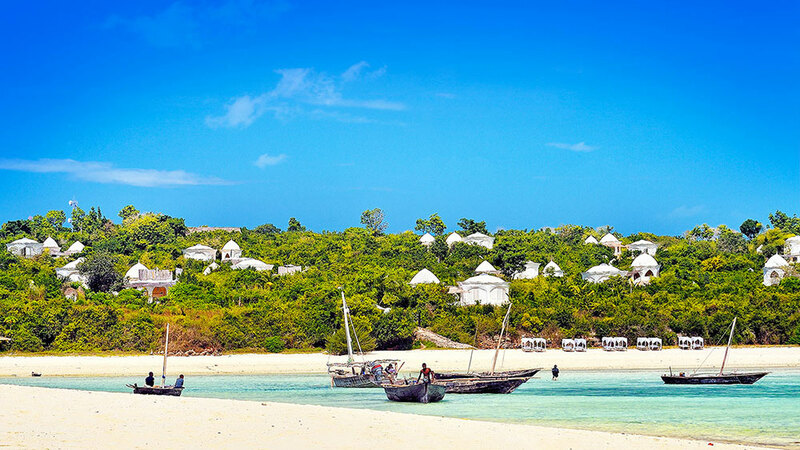 The white dome-shaped chalets look onto the picture-perfect clear water and white beach sands that Zanzibar is famous for. Kilindi’s eco-friendly lodge incorporates large windows, allowing beautiful views of the ocean and cool breezes to circulate throughout the spacious chalets. The chalets’ tropical garden setting, private plunge pools, and tranquil deck provide an unforgettable space to escape and relax. Catch a glimpse of the red colobus monkeys and other fascinating wildlife from your private deck, relax in your plunge pool or the infinity pool, or explore the beaches and surrounding areas. 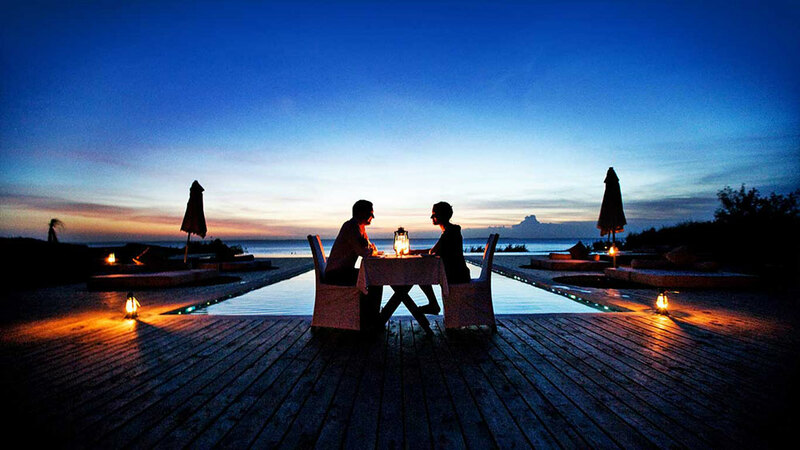 The hotel is made up of 13 Pavilion Suites, each with their own plunge pools and uninterrupted ocean views. The windows, instead of using glass, are shuttered in the traditional way, allowing cool breezes to circulate through each suite. Service is excellent and consistent, with dedicated butlers attending each room. This means that visitors who seek an extra level of privacy will not be disappointed at Kilindi. All beds have mosquito netting for extra protection against insects. The public areas of the hotel include an infinity pool and tranquil sun loungers, and dinners are either served on the terrace or the beach. There is also WiFi available in all public areas. Kilindi can arrange various daily activities and excursions on the Spice Island, including scuba diving, jet skiing, knee boarding, deep sea fishing, sunset cruises and Stone Town walking tours. The Minai Bay Conservation Area is a great spot to see dolphins and to do some snorkeling on the coral reefs. Want to see the Kilindi Zanzibar as part of a trip? Enquire today to let us help build your holiday.